I’ve started our second series on DevChatter. 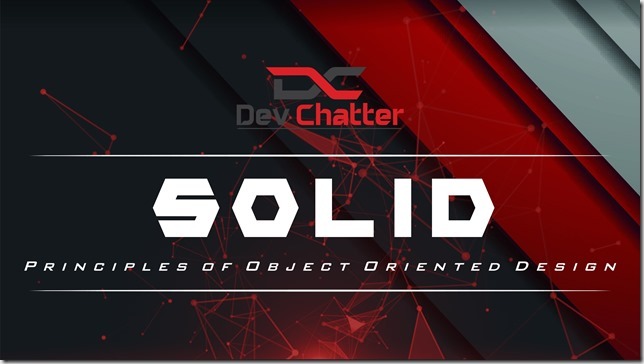 We’re doing SOLID Saturdays now, which means that we’re dedicating each Saturday to a SOLID Principle of Object Oriented Design. Very likely, after we’re done with 5 SOLID Principles, we’ll add a few bonus SOLID Saturdays with the concepts of DRY, YAGNI, and maybe a couple of other good principles. So far, we’ve completed 3 of the SOLID Principles, Single Responsibility Principle, Open/Closed Principle, and Liskov Substitution Principle. You can watch the videos of our SOLID Principles Series on Twitch. In each of those episodes, we started off by discussing the principle, why it’s important, and how to notice violations of it. We talked about where we’re following it in our code, and looked at real examples of the principle, rather than just some contrived examples. We then spend the rest of the stream writing code, and where it’s applicable, we mention the principle again. In our next episode, we’ll be looking at Interface Segregation Principle, which will give us the chance to make some changes to our codebase and improve our interfaces to better match the design that Interface Segregation Principle would push us toward. Join us each Saturday at 1:00 PM Eastern Time to learn more about SOLID programming and see some live coding as well.